There is a new pest invading our beloved crape myrtles here in North Texas. 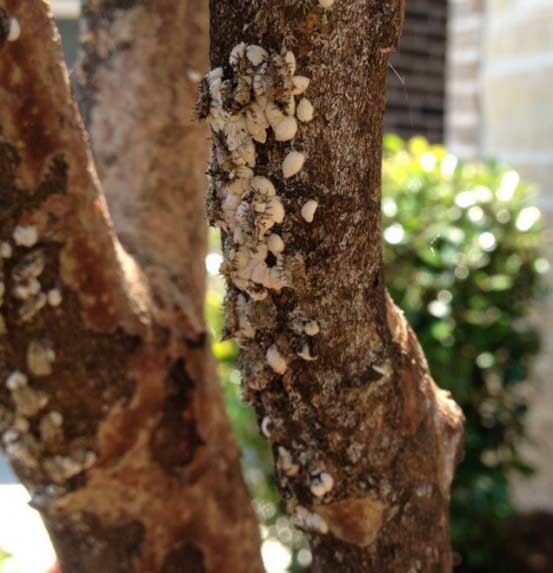 Have you seen a strange white cottony growth on the trunks of your crape myrtles? If you look closely, you’ll notice that it is alive! Meet the crape myrtle scale. It destroys the bark of crape myrtles causing a lot of damage in a small amount of time. It’s also accompanied by heavy layer of black sooty mold, which you can see on the branches in this photo. The best time to prevent scale is in January and early February with an application of dormant oil. Once the scale matures in spring it can be difficult to kill the adults with pesticides. If your crape myrtle is heavily infested, you can wash the trunk with a soft cleaning brush and mild dishwashing soap. This will help remove many of the female scale insects and eggs that will hatch anew. This washing also helps remove the sooty mold. However, crape myrtles afflicted with sooty mold are often growing in locations that are too shady to support them. Sometimes nature will step in and beneficial insects will take care of the problem for us. If you look closely at the photo, you’ll also see ladybug larvae feeding on the scale. Ladybug larvae are highly effective beneficial predators and can quickly destroy many of the pests. Be sure that you’re having your trees properly pruned by a certified arborist: The scale will often start by attacking poor pruning wounds or other damage in your crape myrtle. Have photos you’d like to share? Vist us on Facebook and Twitter. I’ve noticed similar junk on my boxwoods that are under my crape myrtle. Is this the same thing? Can I treat it the same way? Hi Karin – so sorry for the delayed response on this post – we were having a bit of a snag with our commenting feature! It could be the same species of scale – most often crapemyrtle scale is found on azaleas. But either way, most scale is treated the same way so the recommendations provided in the blog post. You could also possibly have mealy bugs on the boxwoods as well – they also have a white cottony appearance.